This app is great for all kinds of use cases - whether you're using Enplug for internal communications or would like to let your customers or visitors know what the traffic is like out there, the Traffic App is the way to go. Full window: This shows one location, which can be zoomed in or out as you'd like. Left-top / Right-top and full window: This adds a cutout for a different location in the upper left or right hand corner of the map. Left-bottom / Right-bottom and full window: This adds a cutout for a different location in the lower left or right hand corner of the map. Right-half and left-half: This allows for a split map, with the right and left half of the screen split between 2 different locations of your choice. 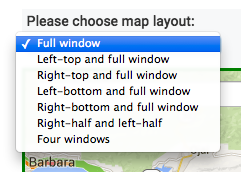 Four windows: This splits the screen into 4 sections, allowing you to set a different location for each of the 4 sections. Then, select your location. Either 1) Press the blue Current location button in the upper right to switch to your current location, or 2) Type your desired city into the search box(es), and click the result that you'd like to show. Zoom in or out using the +/- buttons in the lower right corner, or your mouse scroll wheel. See the example below, of a Four window setup with 4 locations (Los Angeles, Taipei, Amsterdam, and San Francisco) set up with different zoom levels. 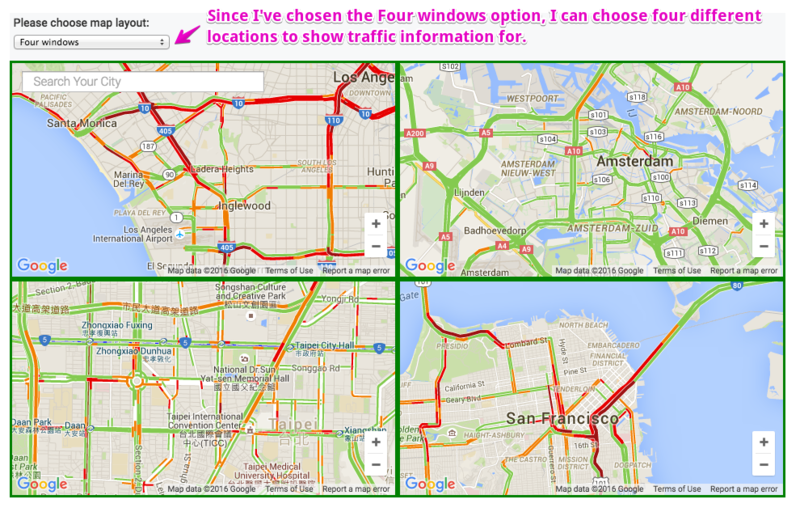 Finally, once you've finished setting everything up, press Save changes to save your Traffic App layout!